The Valle de Oro National Wildlife Refuge, located in the South Valley of Albuquerque, New Mexico, is the first US Fish and Wildlife Service (USFWS) refuge in the Southwest to be designated an “urban refuge.” The South Valley is an unincorporated, heavily industrialized community that is also home to 40,976 residents, 80% of whom are Hispanic or Latino. As the area is plagued with unemployment, 25.9% of the population lives below the poverty line, while the median income for families is just under $33,000. In addition to these challenges, the area is registered as a Superfund site due to contamination of groundwater with organic solvents, aromatics, and halocarbons (gases such as chlorine and bromine). Farming in the South Valley relies on irrigation from the Rio Grande, a historically polluted river. Untreated drainage then returns to the Rio Grande, along with treated wastewater from a sewer treatment plant that processes waste from Albuquerque and parts of the South Valley. Long before the old 570-acre dairy farm became a wildlife refuge, residents of South Albuquerque initiated efforts, spearheaded by the Mountain View Neighborhood Association, to protect the land as a natural area and keep out industrial interests. In 1999, the Trust for Public Land received a grant to preserve the 570 acres, which were finally designated a National Wildlife Refuge in 2012. Today the Valle de Oro Refuge is part of federal efforts spanning multiple agencies (see the Urban Waters Federal Partnership and the Great Outdoors Initiative) to reconnect urban communities with the natural environment, provide educational and recreational activities, and connect natural areas with the historic and cultural heritage of urban neighborhoods. 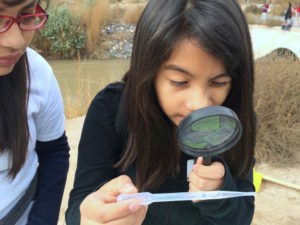 The refuge is also part of the Middle Rio Grande Conservation Initiative, which aims to address water quality, as well as environmental justice issues, in communities that live along the Rio Grande. With funding from the US Environmental Protection Agency (EPA) Urban Waters Program, Amigos Bravos partnered with area organizations, including the Bosque Ecosystem Monitoring Program, Earthforce, Talking Talons Youth Leadership, and Wetwater Environmental Services, to engage youth directly in water quality monitoring in the Rio Grande and adjacent irrigation ditches. Youth were recruited from schools closest to the refuge, since these students have the least access to their local waterways and are also most impacted by potential contaminants and related health concerns. Some students from Greater Albuquerque became involved as well. Twelve local elementary and middle schools, as well as community centers and organizations, participated in the water quality events. Talking Talons Youth Leadership also involved high school graduates from area schools. Students sampled for nutrients, heavy metals, dissolved metals, pharmaceuticals, gross alpha and beta radioactivity, PCBs, and E. coli., and recorded field parameters, including pH, temperature, turbidity, conductivity, and dissolved oxygen. Wetwater Environmental Services led the instruction on sampling collection and methodology, and they participated in a total of 21 water quality events, including 16 in which samples were analyzed by an EPA-certified laboratory. The remaining five events utilized educational water quality testing kits and a multi-parameter water quality meter to record field parameters as mentioned above. While this project has provided one and a half years of baseline water quality data, long-term water quality monitoring is desired. Over the next several years, the refuge will be developed into a series of wetland management units and a stormwater swale, which will connect to the adjacent bosque (a forest that forms as a corridor along rivers and riparian floodplains in the southwestern part of the United States). From a water quality standpoint, the desired outcome is to better treat the stormwater flowing through the refuge via the natural processes of a proper functioning wetland, before entering groundwater and ultimately the Rio Grande. 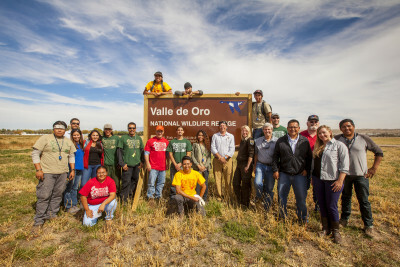 The Valle de Oro Refuge will continue to serve as an invaluable educational and recreational resource for the South Valley as it undergoes further development in the coming years. US Fish and Wildlife Service. “Valle de Oro Fact Sheet.” 2014. Wetwater Environmental Services. Interview with Christian LeJeune, Principal Investigator. Formed in 1988, Amigos Bravos is a statewide water conservation organization guided by social justice principles and dedicated to preserving and restoring the ecological and cultural integrity of New Mexico’s water and the communities that depend on it. While rooted in science and the law, our work is inspired by the values and traditional knowledge of New Mexico’s diverse Hispanic and Native American land-based populations, with whom we collaborate. Our vision is of rivers so clear and clean we can bend to our knees, cup our hands, and drink directly from those waters without fear. This is the vision that was handed to us by Pueblo Indian and native Hispanic Elders at our first strategic planning session not long after our inception as an organization. That vision, which was a reality in northern New Mexico only one lifetime ago, requires the wisdom, knowledge, and participation of all New Mexicans in the effort to address social and political pressures poisoning our waters.